Always the bridesmaid... finally the bride. Copenhagen is ranked as the world's most liveable city by the bespoke magazine Monocle this year. Munich, last year's winner, was bumped down to number two. Monocle has been my favourite magazine for ages, now I love them just a little bit more. Cyclist illuminated by Late Evening Light. Apart from the traditional scientific and statistical parameters like cost of living, schools and health care, etc, the judges have taken quality of life aspects like lifestyle, design and culture into consideration. Copenhagen is praised for its attention to environmental causes, it's rich design culture, a fantastic food culture, the swimmingly clean harbour, the city's many green areas, the Metro, the architecture and the use of bicycles. Then there are the many Michelin-starred restaurants and coffee bars and - according to Monocle - the many beautiful people who ride their bikes everywhere and recycle their garbage. See... it's NOT just us! 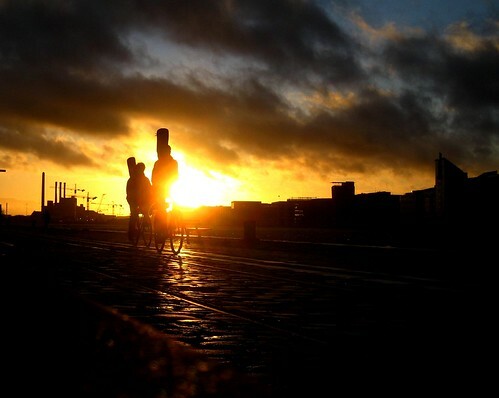 Two musicians ride along the harbour in the sunset. Tyler Brûlé - the editor of Monocle and Wallpaper* is behind the Quality of Life Survey. He describes the Urban Manifesto for what makes a liveable city in an article on the International Herald Tribune's website. Here's the IHT's entry on Copenhagen last year, in light of our second place ranking. 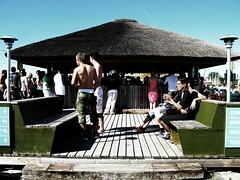 Copenhageners at a beach bar - Halvandet - on the harbour. My parents are Danish. I have never quite forgiven them for coming over here to live in Australia where they had their children. We were always first generation Australians - which left us all feeling as though we were from another planet. 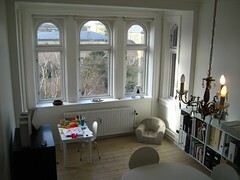 When I finally made a trip to Denmark for the first time, I felt as though I had come home. Thank you for your lovely post. British towns and cities conspicuous by their absence. you're welcome, linda. thanks for sharing that. westfield... when you YOU coming 'home'? Congratulations Copenhagen. I am tres jealous! Am curious about that Minneapolis entry there. How liveable is a city where 3/4 of the yearis spent in complete snowed-in arctic misery? Zakka wrote westfield... when you YOU coming 'home'? 30 or even 20 years ago I might have been in with a chance, but I doubt that Denmark would allow me to be a resident now - even if I could afford it. As for a visit - oh yes! Definitely on the cards, but not for this year. Research shows that the best costs money, so, it's pencilled in for next year. Shanna... the climate here is basically the same as in Portland. But I read that many factors are in play, including direct international flights and things like that. Martin... you DO like competing! Although I'll back you on this one. I've lived in Melbourne - twice, actually - and Sydney is always the bridesmaid to Melbourne's bride. Westfield... look at it this way... even the lot that came over from Normandy [land of the Northmen] with William the Conquerer were of Viking descent, so you're a viking no matter how you look at it. Its only about 6 months out of the year. And believe it or not, there are more than 10,000 of us that ride to work/for leisure year round. Including when temps drop to -15F and lower. I would explain the "wind chill factor" but I think that temp will drive the point home. And the coffee IS really good here. I'm not sure how Sydney creeped up to number 11, with it's traffic and bleak lifeless suburbs, but nevermind. They must have ignored 80% of the city. I'd say the same is probably true for a lot of those other cities - certain areas are amazingly liveable, and others are definitely not. Thanks for the nice post. I agree that what you say is very true and I am proud to be living in Copenhagen. pleased to hear it, ajish! me, too. que envidia de ciudad tienen, espero aqui en guadaajara jaisco mexico agun dia sea igual e uso de la bicicleta. gracias! i wish you all the best for guadalajara! I worked hard to defend Minneapolis while living out west in the mountains, though I did question moving back to one of the coldest winters on record! However, the people are wonderful and the spring/summer/falls are tough to beat (even if they are a bit shorter than desired). That being said, I'm ecstatic to be visiting Copenhagen very soon!! That will be the true test! Congratulations... hopefully Toronto can learn... top 10 would be nice one day..